In this guide, we will discuss about Ubuntu, Run Level and Auto Starting Application with some practical example to configure app to auto start. Silence is golden, so one day’s break in the flow of our publication! Basically, we are checking vulnerabilities of the virtualization software on our servers. Run Level is not much known to the casual users, it is quite important for precise control of Applications and the order of starting application can impact performance – yes, logically they should not, but it can happen on Cloud Server due to multi-tenancy and virtualization software. Run Level is written as runlevel, it refers to a mode of operation in UNIX and Unix like System. Since many decades ten runlevel used to exist, now usually seven run levels exist, they are numbered from zero to six. S used as a synonym for one of the levels. Only one run level is executed on boot up – run levels are not executed sequentially, numerical value does not matter. This is a kind of directory located in /etc/ and we can find the runlevel with the command like who -r. It will, return result like run-level 2 2014-10-03 18:48. This is an example of using UNIX pipe. Now we need to auto start an application on boot. Take that application is well packaged and has existence inside /etc/init.d/. For example, take application’s name is abhishek-nova-test and we need to run it as second process during boot after se-linux-distrubution starts. KDE uses runlevel 5. We can change the runlevel with command init 3 or editing the file /etc/inittab. Only a reboot will be enough to reflect the change. It is very dangerous because on runlevel 3, web server might not be running by default. Except for educational purpose or development, do not change these unless you know fully about Linux Kernel. Inside /etc/ you will find lot of directories like /etc/rc2.d, /etc/rc3.d and so on. You can view this from SFTP and browse inside /etc/rc2.d – it contains symlinked directories. What we need to do is Symlinking. If you do a reboot, it will work. If you want to delete, simply run rm -r /etc/rc2.d/S02abhishek-nova-test && reboot. This Article Has Been Shared 660 Times! Cloud Storage provides an online space for storing any type of file, like images, videos or backup from your computer via web interface or special software. 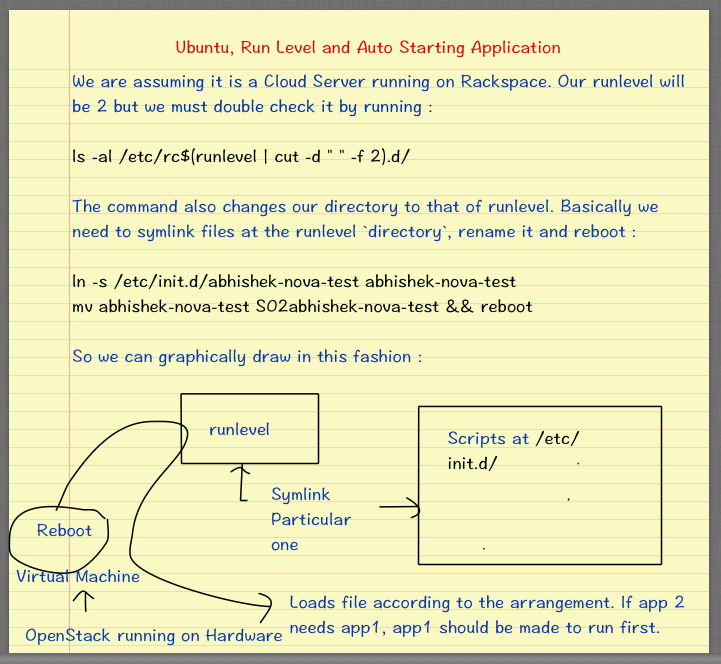 Cite this article as: Abhishek Ghosh, "Ubuntu, Run Level and Auto Starting Application," in The Customize Windows, October 6, 2014, April 23, 2019, https://thecustomizewindows.com/2014/10/ubuntu-run-level-auto-starting-application/.